A lot of people are confused about carbohydrates and are unsure of how to work them into a healthy diet and this can be so frustrating! 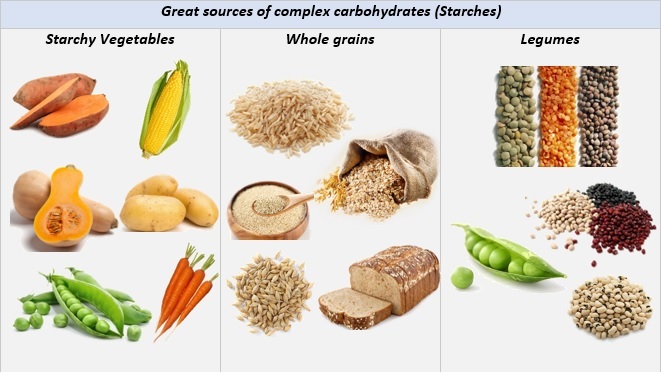 So to put the confusion to rest…Carbs can be divided into complex carbs and simple carbs. Simple carbs, such as white bread and flours, are processed foods that are stripped of their nutrients, wheat germ and bran during the refining process. They offer little nutrition, are low in dietary fibre and are a source of refined simple sugars. In contrast, complex carbs retain their nutrients, wheat germ, bran and the kernel. They are a source of dietary fibre and are digested more slowly in the body, they also provide vitamins, minerals and are important to the health of an individual. The majority of carbohydrates should come from complex carbohydrates (starches) and naturally occurring sugars, rather than processed or refined sugars. The table below illustrates great sources of complex carbs that can be incorporated into your healthy diet.